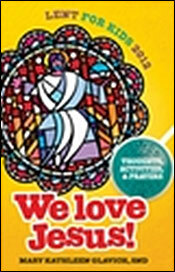 Lent for Kids 2012: We Love Jesus! Through these wonderful gospel-based stories, activities, and prayers, children learn the true meaning of Lent and how to follow Jesus in their daily lives. 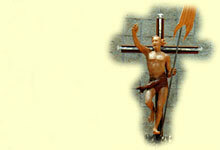 Sr. Kathleen invites them to respond to Jesus and the cross with open hearts and joy. St. Julie is known as the spiritual mother of Sr. Kathleen’s community, which was founded in Coesfeld, Germany and traces its spirit back to her through the Notre Dame Sisters of Amersfoort in Holland. This book for middle-grade children introduces them to St. Julie Billiart, the foundress of the Sisters of Notre Dame of Namur. She lived during the times of the French Revolution. Although paralyzed from childhood until she was 56 years old, Julie managed to catechize, reestablish the faith in people’s hearts, and start a religious community. Her inspiring story of unflagging love for the good God is relevant for today for many reasons. 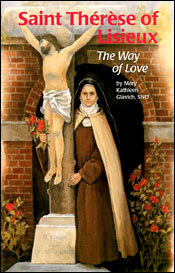 Book is out of print and available only from Sister Kathleen. In 1997 St. Thérèse was declared a Doctor of the Church, the third woman to hold this title. 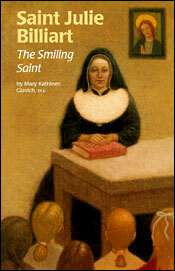 In this book middle-grade children meet one of the most popular and well-loved saints, St. Thérèse, commonly called the Little Flower. They learn about her life at home with her sisters and father and her years in the Carmelite convent. They read about Thérèse’s "little way" to God that led her straight to him in her brief life of 24 years. They discover her promise to send roses to earth. 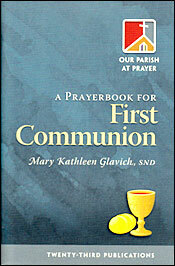 The book concludes with a prayer and a glossary. After writing a book on St. Thérèse, Sr. Kathleen was asked to write this book because Mother Teresa was named for St. Thérèse. 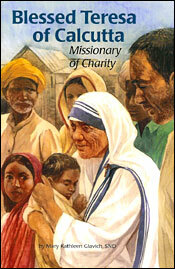 This book tells the story of Agnes Bojaxhiu, famous for her extraordinary love of the poor. Children in middle grades will follow this modern-day heroine as she answers God’s call over and over and focuses the eyes of the world on the plight of the poor. 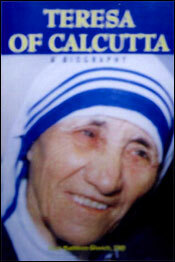 Although a Nobel Prize winner, Mother Teresa remained simple and was acknowledged worldwide as a living saint. Today the communities she founded continue her work. Only a few years after her death Mother Teresa was declared "blessed," a step on the way to being canonized. The artist researched biblical times and worked the results into her art. That is why in the pictures people wear headbands, the sheep have fat tails, and cats appear. This charming book introduces preschool and primary age children to twelve favorite Bible’s stories. Each story concludes with a prayer that focuses on the story’s theme. Beautiful, realistic illustrations by Lydia Halverson enhance the book. Some of the stories are Noah, Joseph and his brothers, Jairus’ daughter, and Zacchaeus. Note: This book comes free with the Kindergarten program of the Christ Our Life religion series written by the Sisters of Notre Dame and published by Loyola. 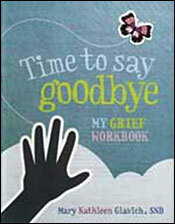 A Student Pack (A Child’s Bible, A Child’s Book of Miracles, and A Child’s Book of Parables) may be purchased for $9.95. This booklet contains twelve stories of Jesus’ miracles including changing water to wine at Cana, walking across the water, healing the blind Bartimaeus, and raising Lazarus to life. The stories are simply told on the level of a small child. They end with a prayer suggestion that teaches the children that God’s Word requires a response. This third book of Bible stories for little children contains twelve of Jesus’ parables such as the lost sheep, the runaway boy, the servant with the hard heart, and the ten bridesmaids. The way the story is told and the suggested prayer at the end help the children understand the point of the parable. 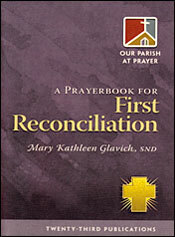 These delightful and informative prayerbooks are a great daily companion for children preparing for First Reconciliation and First Communion. The simple and heartfelt prayers help them express their joy, fears, and anticipation as they prepare to celebrate the sacraments for the first time. Simple explanations and invitations to action accompany each prayer.